Brian Walker, Chairman of Greatham in Bloom, holding their gold Northumbria in Bloom certificate with fellow members (left to right) Hazel Campbell, Ann Murray, Dorothy Clark and Peter Dixon in front of their flowerbed designed in tribute to the RAF's centenary. Picture by Frank Reid. 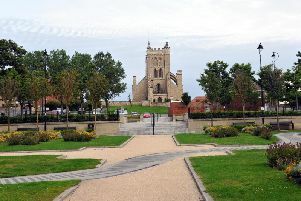 It is one of the prettiest villages in Hartlepool - and now judges of a prestigious horticultural competition have named it as the best in the whole region. For the first time in more than 20 years, Greatham has won the trophy and a gold medal as Best Village in the Northumbria in Bloom competition. The RAF flowerbed in Greatham village. Picture by Frank Reid. Judges were won over by its historic beauty, cleanliness and the efforts of residents, led by volunteers on the Greatham in Bloom group. Brian Walker, chairman of the Greatham in Bloom Committee said: “We are really pleased to maintain our gold medal, but absolutely over the moon to be awarded the trophy for best village entry. “This is a testament to the dedication and community spirit to be found in our village. It is only the second time that Greatham has won the trophy, with the first being back in 1995. The judges described Greatham as “an attractive, historic village which has been enhanced by the residents who have worked enthusiastically to improve their surroundings, embracing the ideals of Northumbria in Bloom. There was further success in Greatham for the residents of Shannon Court who won a gold medal in the Residential Communities category. Judges were very impressed by the plants, flowers and perfectly trimmed lawn. The high point was Mrs Allan’s corner which was “a delightful sanctuary of greenery, flowers and scents”. And a Silver Gilt was also awarded to The Hospital of God in the category for Care/Residential Homes, Hospices and Day Centres. “The courtyard with its covered walkways and a pond is particularly welcoming,” said the judges. They were also pleased to see many residents be responsible for tubs and borders outside their homes. Northumbria in Bloom forms part of the Royal Horticultural Society’s Britain in Bloom.